I sold my blue 9-6 Nova because I wanted a modern LB with just a little more float (too many beers, too few waves…). And because, living in Ventura County you see a lot of Yater LBs with a wedge stringer which I think is pretty cool. And finally because I love light-green resin tint on a LB. So here, fresh from the Lucke Glassing factory, is my new Ice-Green 9-8 Nova Wedgie. Dims: 18″ x 23″ x 14.5″ 3.25″. Shallow half-length nose concave with V in tail. NR 5″ TR 3. 5. Double 6oz deck, single 6oz bottom. 2+1 fin set-up for max flexibility. 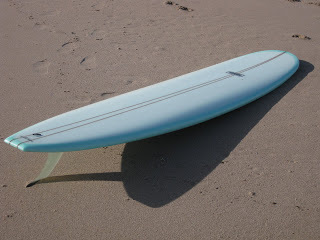 I tried a True Ames 9″ L-Flex B as a single but it seemed like it wasn’t enough fin for the board. Shifting to TA SBs and 7.5″ TA Wayne Rich Classic did the trick. Board is now for sale.